Standard rolls of bathroom tissue have long been used in residential and small commercial settings. Restrooms in facilities that tend to have a good deal of traffic however, such as those in large offices, schools, airports, and public institutions and arenas, benefit from the option to install high-capacity tissue fixtures in restrooms. These reduce the labor costs associated with restocking rolls, reduces waste and theft, and also ensures a more dependable experience for the occupant. 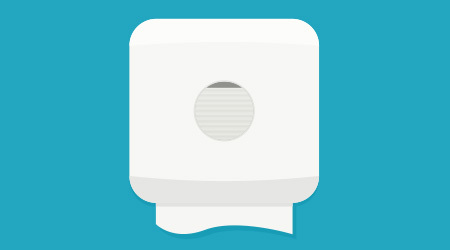 Most modern restroom tissue dispensers hold at least two large rolls of toilet paper. Standard rolls are available in coreless versions and dispensers have grown to accomodate plumped-up standard rolls that are two to four times the size of the traditional roll. Jumbo dispensers hold huge rolls of tissue and are dispensed at the side rather than out the front of the dispenser. High-capacity jumbo rolls provide the equivalent of 10 or more standard rolls, and can reduce maintenance and product costs but also provide greater opportunity for waste as there is no way to control how much each occupant is using.